Was that a smile? Or was it something else? That’s what the GroupLens lab is wondering about regarding a certain special emoji over at the University of Minnesota. It turns out answering this question is harder than you think, and goes to show that you can’t always be sure of what someone means when they send you a quick emoji as a response. Emojis are essential for any avid mobile communicator. No one has the time these days to write out full, carefully thought out sentences when a simple image will suffice. The problem is being sure you are communicating what you mean by that emoji, and that’s what the researchers decided to investigate. The emoji at issue, shown in the chart below, is called “Grinning Face With Smiling Eyes” on Emojipedia (Yes, there’s an encyclopedia of emojis). And as it turns out, it looks a whole lot different depending on the device or app you use. The grinning, rosy-cheeked version on Samsung Galaxy devices is the same emoji that looks, well, mysterious on Facebook Messenger and Apple iMessage. And this is where the confusion begins, according to the GroupLens research lab. A recent survey conducted by the lab, in conjunction with the group’s emoji-rich academic paper, sheds light on how people react different to emojis depending on the device they use. They tested this grimacing (or grinning) emoji on a number of devices, rating how positive or negative a reaction someone had to the image. 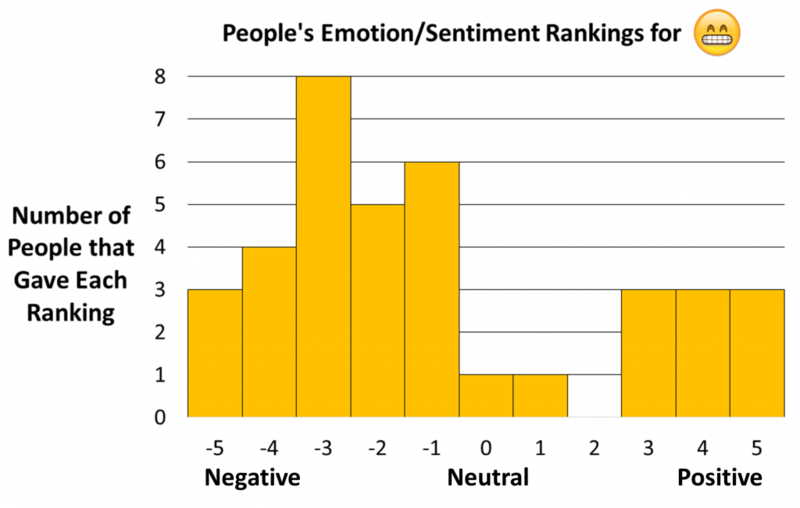 By far, users on Android and Samsung Galaxy devices saw the emoji as a positive message, while iPhone users primarily saw it as a negative message. It’s pretty easy to understand why when you see how different they look compared to the iOS or Facebook Messenger versions. What makes this even more confusing is that a significant number of iPhone users also saw the same emoji as a positive message, furthering the problem that exists with “knowing” what an emoji really means. The lack of a conclusive opinion on the emoji shows how fellow iPhone users can be confused by a message using it. This isn’t something new in the emoji world either. We use all sorts of emojis to convey things beyond their original meaning — just ask anyone using the eggplant emoji a lot. While the original meaning is a positive one, the way the emoji has been designed for new devices has since complicated that meaning. We all communicate differently, and use slang, emojis, and other things to say what we mean as quickly as possible. Think about that the next time you send this emoji to your friends and wonder why someone misunderstood the intended meaning. It might be that they saw the expression as half-smile, or perhaps half-frown — or maybe they’re just using an iPhone. Affectiva is just one of the startups working to create emotion-tracking A.I. that can work out how you're feeling. Here's why this could change the face of computing as we know it. There are more options for media streamers than ever, so it’s difficult to pick the best option. But that’s why we're here. Our curated list of the best streaming devices will get you online in no time. The Google Pixel 3 and Pixel 3 XL are considered to be two of the best Android smartphones, but it looks like Google could be prepping a midrange line. Say hello to the Pixel 3a and Pixel 3a XL. Your iPad sports a stunning 9.7-inch screen and you'll want it to stay that way. The best iPad (2018) screen protectors guard against cracks, scratches, and even smudging from your fingers. Check out our top picks here.